Ahhh we have been blessed this week with extraordinarily nice weather. The hot weather has yet to come but I have been on cloud 9 with all sun. Here I am getting my dose of much-needed vitamin D after this dark winter. Getting your daily requirements of vitamin D is difficult to obtain from food alone – it is only found in oily fish like tuna and salmon as well as milk. The best way to get it is to stand out in the sun (with sunscreen) and drink it up. Vitamin D aids in the absorption and utilization of calcium which will keep your bones strong and prevents osteoporosis. Research studies also suggest that getting enough vitamin D may help prevent high blood pressure, multiple sclerosis and some forms of cancer. I think this post should have been called “Body Break“. 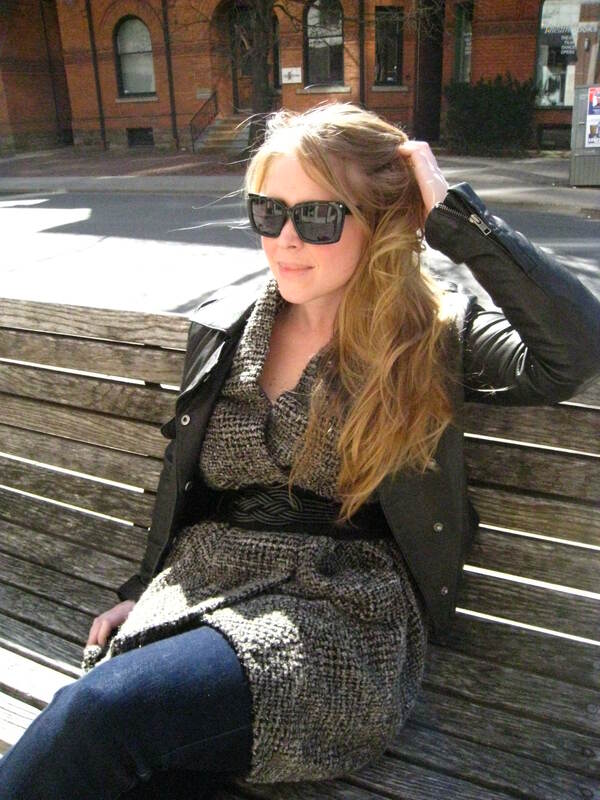 Wearing my fave leather jacket that I bought from Club Monaco on Bloor St 2 years ago at 70% off for $150. The leather is still soft and it has maintained its original shape quite well. Jeans are by Uniqlo in Soho and oxfords are from Century 21. Love the zipper detail of the jacket. Sunglasses are $19 from Joe Fresh. Sweater is a Zara purchase from last year. It was on sale for $20. JD’s Fresh! or at least trying to be in my Zara trench coat. Taking a pretend stroll and loving the weather in my ultra comfy basic black heels from Feet First. A wise $99 investment for lasting in heels 10 hours a day. Parachute day! 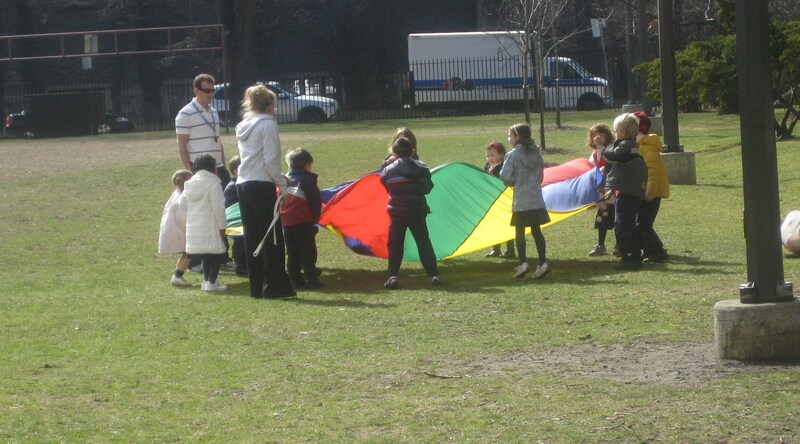 I used to love parachute days in elementary school….how fun was running under a brightly coloured piece of material? So simple. So fresh. This skirt from Joe Fresh ($19) is an amazing anchor piece and gives me the freedom to wear it a million different ways. That’s key in building your wardrobe. 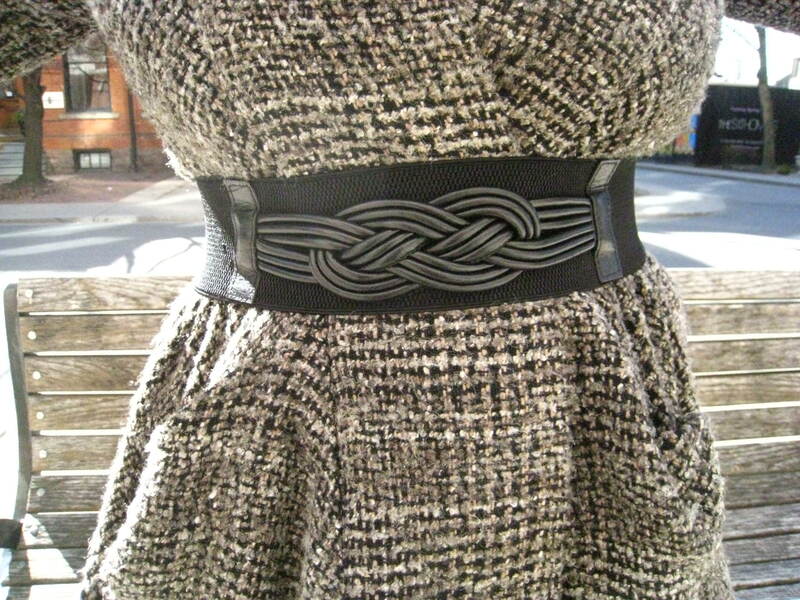 If you can wear it a ton of different ways – buy it! My nautical inspired top is from H&M; scarf is from the Port Colborne Thrift Store ($2); belt came from a clothing swap party($0); and these sunglasses are my vintage Angelo Damiano aviators. I wanted to buy the new Joe Fresh trench coat this season because it was just a classic, perfect trench in an amazing quality fabric for just $59! insane. But I picked up the wrong size to try on and when I went back to the rack (one minute later) the size I needed was gone! You gotta be fast with Joe. People are die hards and they steal everything the second it lands in store. What’s your favourite Joe Fresh find? A Sunday stroll, a bite to eat, coffee in hand, and lots of gabbing is how I recently spent some quality time with the bff on Abbot Kinney Blvd – an amazing street in Venice, CA. We strolled on over to Gjelina’s for brunch which was a cool spot with delicious food. Service was a bit slow but we were in no rush so it didn’t matter. 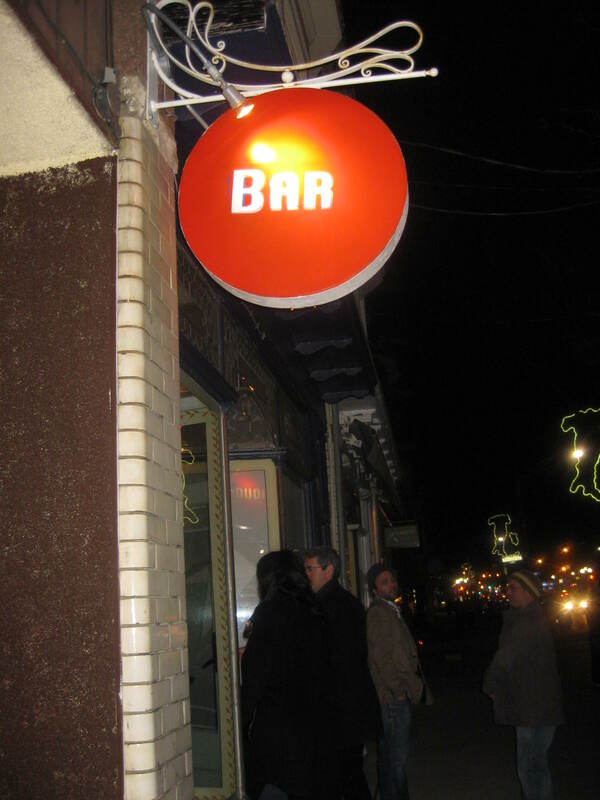 I should have taken a pic of my sandwich – it looked so good and was a 9.5 on the taste-o-meter. 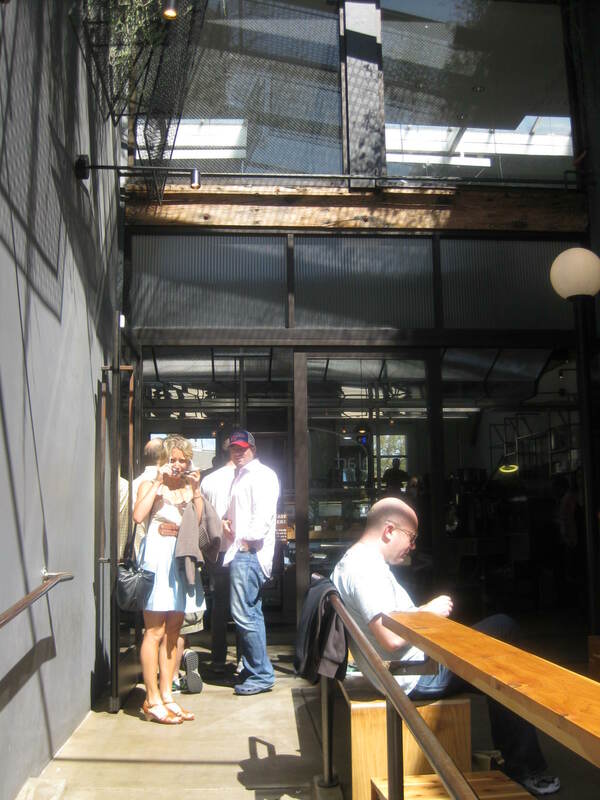 We then went to Intelligentsia for coffee and spotted Toby Maguire, his wife, and baby in tow. He was quite striking in person – I liked the beard he had going on. The sun made the day just perfecto. 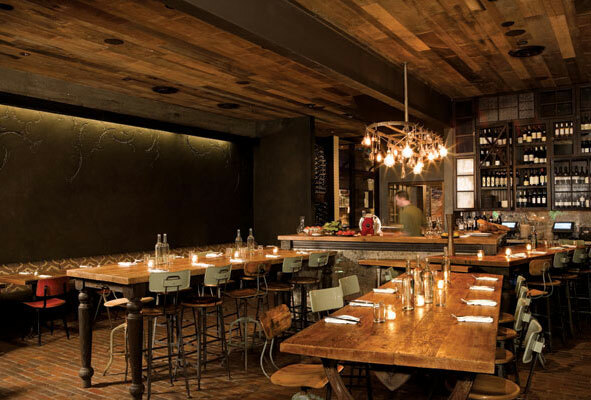 My friend Noreen and I had good eats, drinks, and chats at Cinq 01 on College street last night and closed the restaurant down. Literally. Every time the two of us meet up we just have so much to say that before we know it the place clears out, the music dies down, and the workers start sweeping the floor until they finally say “ladies I’m going to have to take your drinks away.” The last time we were out they put all the chairs on the tables and turned the lights off! We finally got the hint. 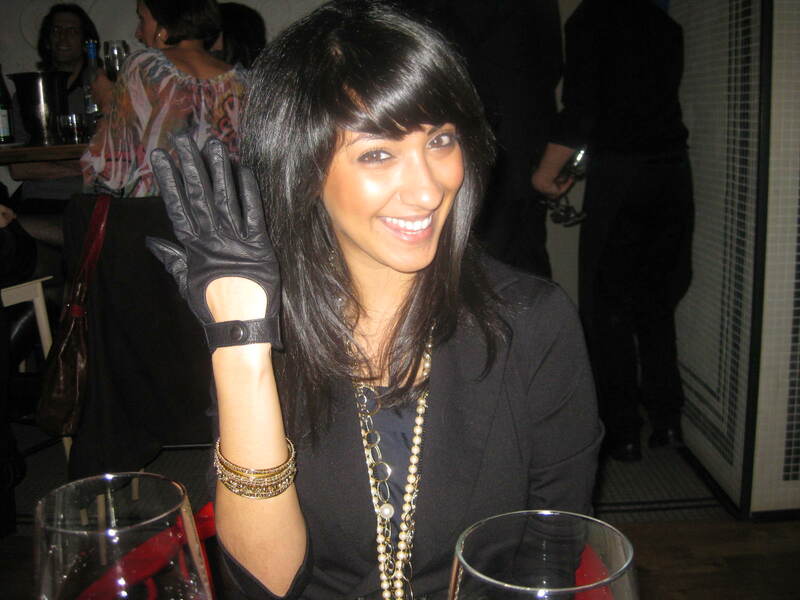 Noreen is a fan of my driving gloves from Aldo Accessories. I’ve received a lot of compliments on these gloves and some insults from guys saying they look like baseball gloves. What do they know?! 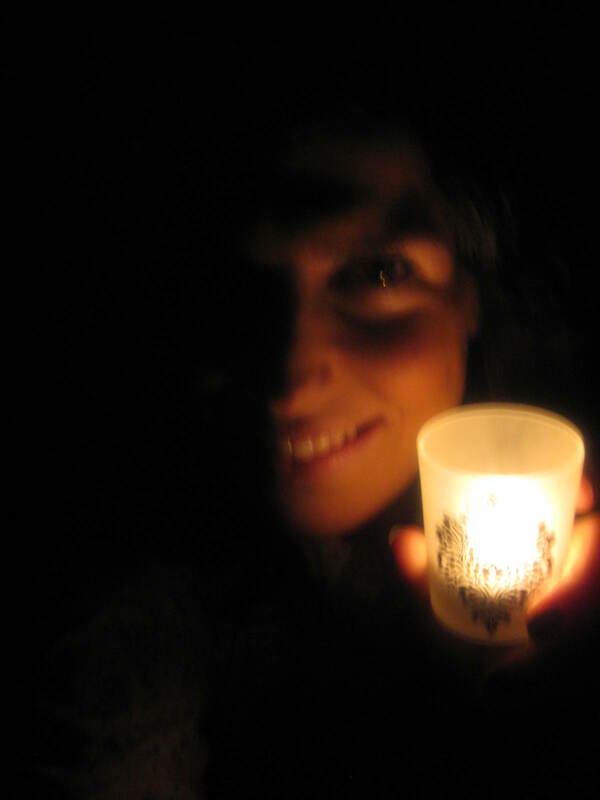 Tomorrow the Toronto Star, the National Post, and the Globe and Mail will tell us cute stories of how people in the GTA spent Earth Hour. These stories will be clever, romantic, and most likely family oriented. They will be about children who played Scrabble instead of video games. How sweet. They will make those of us who kept the lights on feel bad that we didn’t flick them off. This shot was taken after a sun-filled day in Venice, CA. I look relaxed because I really was! Relaxing is something I cherish. You can’t put a price tag on relaxation and that’s why it’s so great. 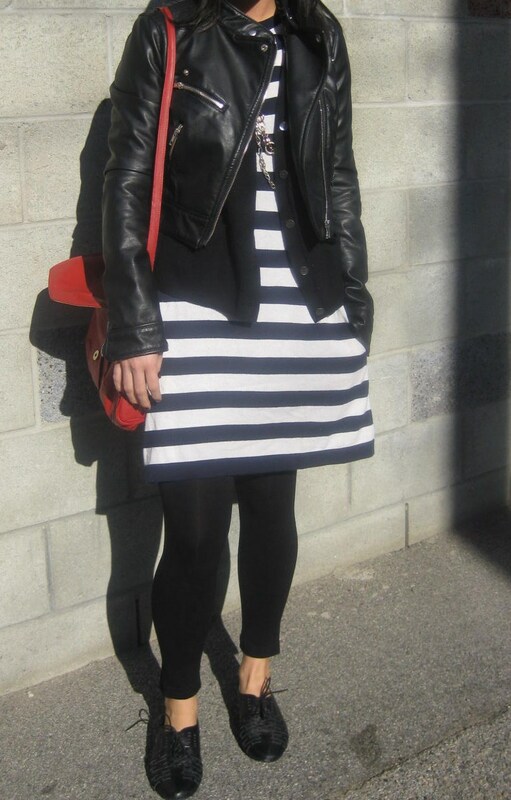 I bought this nautical knit dress at Joe Fresh and it’s one of my favourite wardrobe staples. I’ve worn this dress so many ways. Here I paired it with leggings from Winners, a basic black cardigan from the GAP, some random necklaces, and my moto jacket from H&M. 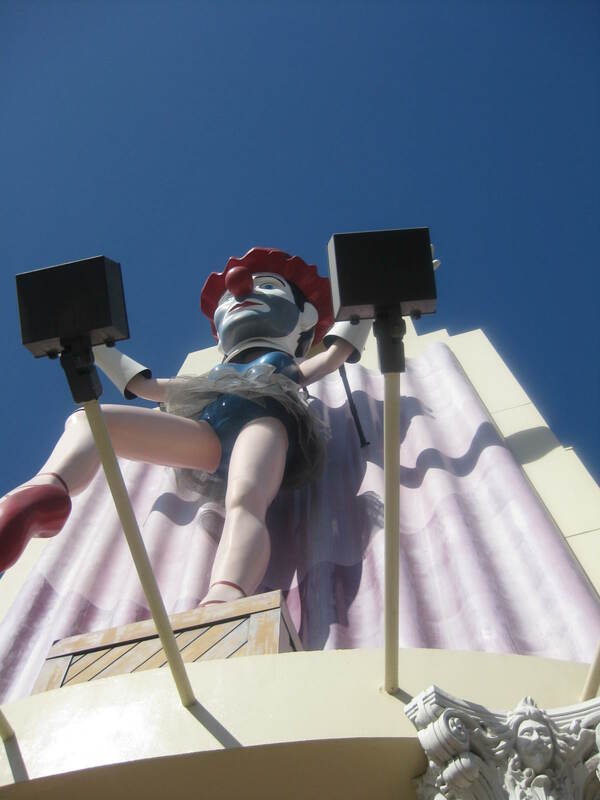 The giant clown above the CVS store in Venice – what’s the story behind this guy anyway? Can anyone tell me? Me and the bff. Windblown.